Colleagues Remember David Gordon Elmes The professor of psychology emeritus died June 4. Psychology department with Dave Elmes (blue plaid shirt). David Gordon Elmes was born to Leslie and Ruth (Adams) Elmes on Feb. 15, 1942 in Newton, Massachusetts. The family relocated to Richmond, Virginia, where Dave was a stand-out athletic talent in boxing and football. A shoulder injury brought his football career to an end prior to his graduation from Douglas S. Freeman High School in 1960. Dave attended the University of Virginia, where he received a B.A. in psychology with high honors in 1964. He remained at UVA for graduate study and earned his Ph.D. in experimental psychology just three years later in 1967. 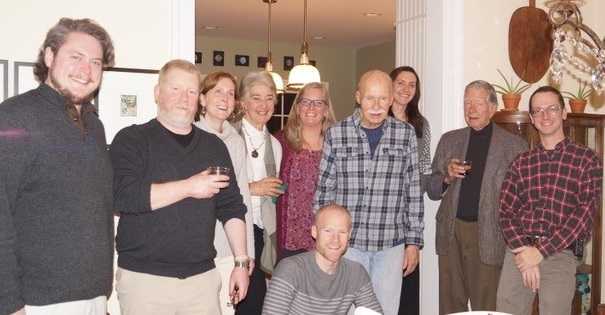 Dave joined the W&L Psychology faculty as a freshly-minted Ph.D. in fall 1967, and relocated to Lexington with his wife, Anne, and their son, Matthew. A daughter, Jennifer, arrived not long after. Dave rose through the faculty ranks quickly — he was promoted to professor in 1975. Dave was a well-respected scientist in the field of cognitive science and served on the editorial board of the influential Journal of Experimental Psychology. He often published research reports with other faculty members on projects as diverse as understanding how rats with brain damage remember where their food is to a monograph on whether people can actually imagine an odor. This is really where Dave’s brilliance shone its brightest. He was always ready to listen to interesting ideas and was able to offer keen insights, even when the research area was outside of his original area of doctoral expertise. His record of achievement as a scientist and mentor includes over 50 conference presentations and more than 30 original research publications, many with undergraduate co-authors. In addition to this substantial body of work with generations of accomplished scientists and undergraduate student collaborators, Dave earned accolades from the broader community of scientists. He held memberships in Phi Beta Kappa and Sigma Xi, and he was named a fellow of the Virginia Academy of Sciences, as well as the prestigious Association for Psychological Science. This latter honor recognized his “sustained outstanding contribution” to psychological science. Elmes was a research associate at the Human Performance Center of the University of Michigan (1974-75) and was a visiting fellow of University College, Oxford (1987). Dave served as head of Psychology from 1990 to 2000 and as director or co-director of the Cognitive Science Program from 1984 to 2000. During his time as head of Psychology, Dave led departmental planning for new facilities in the Science Center and expertly guided the expansion of the Psychology faculty. Dave was not just a great leader and scientist, but a tireless mentor devoted to growing new scientists. Dave preached what he practiced: he served as a councilor and as president of the Council on Undergraduate Research, an organization whose mission focuses on supporting undergraduate research, so that students might reap the rewards of collaborative research experiences with faculty members. Elmes retired from W&L in 2007 and continued to teach in an adjunct capacity until 2010. In a reference letter supporting Dave’s application to W&L in 1967, one of Dave’s mentors, UVA psychology Professor Frank Finger, wrote of Dave, “Personally, he is A-1. Pleasant, unaggressive, civilized, cooperative, quietly outgoing, sense of humor, knowledgeable in athletics and a nice wife and son. He’ll be a good citizen.” Through the very end of his career and life, a fuller assessment would need only add that Dave was scrupulously honest, forthright, fair-minded, generous and loyal. He was dedicated to his family, his students and his colleagues. The field of psychology will probably remember Dave best for his many books on experimental psychology methodology coauthored with Barry Kantowitz, Roddy Roediger and his colleague at W&L, Joe Thompson. One of these books has the remarkable distinction of enduring through 10 widely adopted editions as one of the most popular texts in this area. Those of us on campus will remember his humor and his clear thinking. We’ll miss the fishing trips and the applied probability seminars. We’ll miss those things and Dave very much.